Born Betty Shepherd, she joined the Labour League of Youth and became an active member of the Labour Party. It was through this shared interest that she met her future husband, Andrew Douglas Hamer, better known as Dougie. They were married in 1954 and became the proud parents of three sons and a daughter. Represented Halliwell Ward from 1966 until her death in 1995. Chairman of the Social Services Committee in 1980 until 1984 then again from 1990. She also served on the Education and Arts, Management and Finance and Planning Committees. In 1983 a fire claimed the life of her husband Dougie as he searched the house for their daughter, who had in fact already escaped the building. Betty herself was injured during the blaze when forced to jump from an upstairs window to escape, but after several months of recovery she returned to continue her work as a Councillor and activist. She campaigned tirelessly to improve the lives of Bolton's children, elderly and disabled residents by being a major fundraiser for the Jubilee Centre, Pool and Minibus. She also took parties of disabled people on holiday to Bolton's twin town of Paderborn on many occasions. In 1996 a lifetime of hard work and service to her town was given a worthy memorial with the launch of the Betty Hamer Life Education Unit - a mobile classroom unit incorporating high technology equipment aimed at teaching children how to look after their bodies. 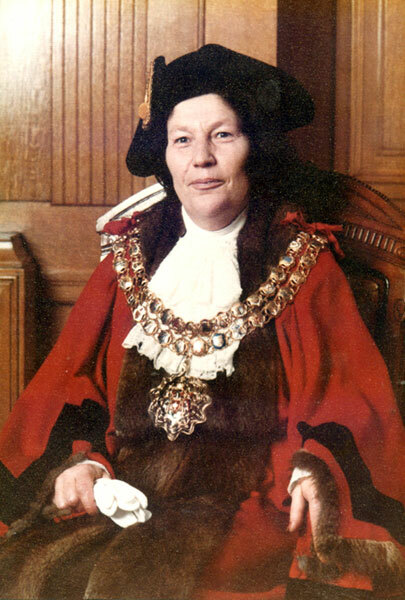 Her daughter in law, Janette Hamer, was Mayoress. 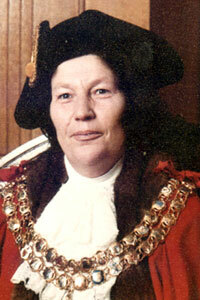 Formal portrait of Elizabeth Olwen Hamer as Mayor of Bolton.